[By Nick] So here we are again with another pint of Jeni's I paid $6 for (after coupon) at The Fresh Market. To be honest, I was really irritated with my last experience that I was hesitant to pick up another pint. 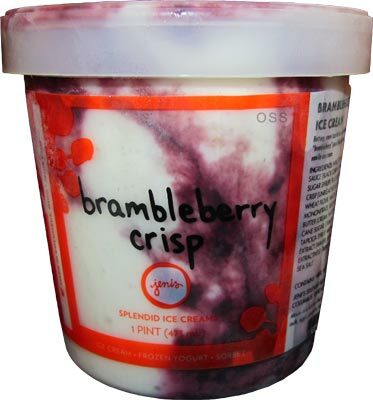 However, I've wanted to try their Brambleberry Crisp flavor for awhile now. 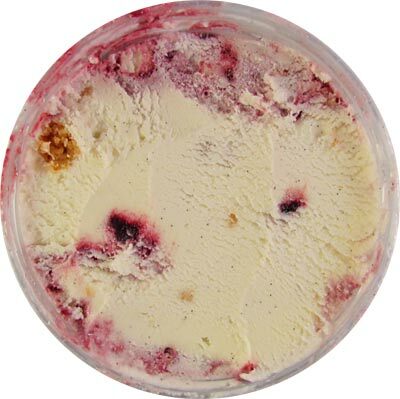 Blackberries are one of my favorite fruits and it's not every day that you see a flavor utilizing them as Jeni's has. That and I don't think we've ever covered a flavor with black currants involved either. Here's hoping this pint will be worth the money I paid for it. Hey, at least this looks pretty and it's certainly appears to have an abundance of swirl for once. 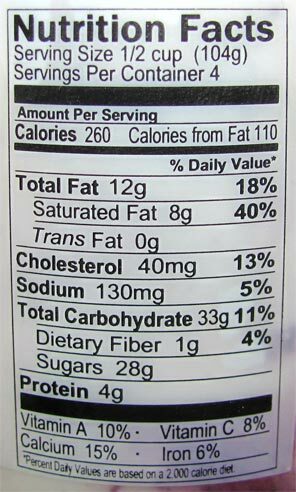 I don't really see much of the crisp component but that doesn't shock me either. Once again, Jeni's proves that they're masters when it comes to a base's texture. This ice cream is dense, rich and one of the smoothest ice creams that I've encountered. While the description says this is just a vanilla ice cream, there's no denying that it's a vanilla bean base. You can see the specks everywhere and the more intense flavor is definitely noticeable. 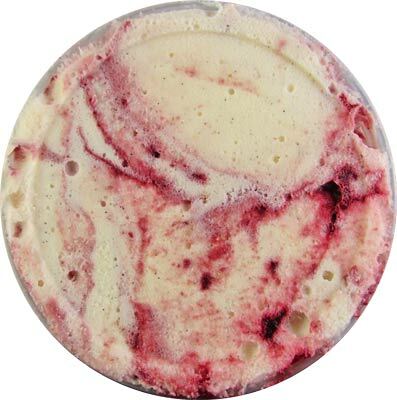 The brambleberry sauce is a nice compliment to the vanilla bean base. You get the tartness from the blackberries with just a hint of added sweetness to the overall product. I don't really notice the black currants to be honest. I know what they taste like but they're just not registering with me. Lastly you get the oat struesal which is pretty lackluster in the flavor department. While the ingredients lists a various amount of spices involved, all I'm tasting is pure oats. The texture is nice, simulating a crunchy oat topping to any normal crisp. I'd just like there to be more depth of flavor going on with it. The main problem here is that unlike the other bases I've had from Jeni's is that the flavor isn't that remarkable. I've had better from brand such as Talenti, Graeter's and even The Gelato Fiasco. The mix-ins don't really make up for it either. Sure blackberries and black currants are something you don't come around every day but the latter makes no appearance at all. That and the oat stuesal was as if someone has forgotten to add the spices to it. Once again, there's no way I could justify this ice cream or even this brand for that matter at their normal price. $6 is even way too high for it when other brands are doing the same business practice and putting out superior products for cheaper. Being a business major, I just don't understand Jeni's rational for their pricing structure. This will more than likely be the last Jeni's product I pay for with me own money because I'd rather be using those coupons elsewhere. Verdict? An overall good ice cream but not worth the price by any means. When I see the name "brambleberry" it reminded me of an episode of "Jimmy Neutron" when Carl Wheezer's mom said "I made brambleberry pie"
Anon, +1 for that reference! "$6 is even way too high for it when other brands are doing the same business practice and putting out superior products for cheaper"
What? $10 is pretty standard for pints from all the artisanal ice cream shops I've been to. @Check: The thing to keep in mind is that this blog is based in the freezer aisle, not the artisan/scoop shop scene. Yes, there is a crowd willing to pay $10 for a pint of ice cream (and sometimes the shipping to go with it), but the average Joe is still scanning the freeze aisle for whatever is on sale for $3. That said, is a $10 pint of Jeni's 2.5x better than a pint $4 of talenti or three twins? Is it almost twice as good as a $6 pint of Steve's or Gelato Fiasco? That's how we look at it.